Add the olive oil or butter to the skillet and place over high heat. Sauté the sausage. Break the eggs into a bowl, add salt and pepper and beat. Pour mixture into the skillet and whisk for 3”. Add the kopanisti cheese and continue stirring for 2′. 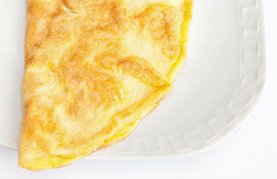 Once the omelette is golden in color, fold it in half, remove from heat and serve.